Yana calls herself an elf “three parts in four”. She is an odd mixture of elven and human proportions. She is tall for an elven woman with a heavier build. 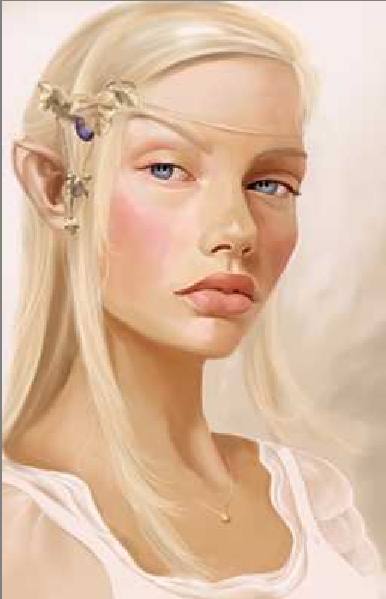 While her face carries mostly elven characteristics, she has fuller lips. Her hair is long and light blonde, which she ties in a ponytail to keep it out of the way. She keeps a single raven’s feather tied to it. Yana has a gymnast’s build and moves deliberately with strength and grace. Her legs, which are often bare are very well muscled. She speaks the local language as a native, and her elvish is practiced and fluent. Age is indeterminate, but she looks young for an elf. Yana’s clothing is very simplistic. She wears yellow and blue silks in all seasons. In colder weather, there is an under layer of padding. Yana even wears her yellow and blue silks on guard duty. As a city guard of Peltarch she wears her badge around her neck in plain sight. She also has a bandolier of throwing knives across her midsection. Yana is a Martial Artist focused on physical perfection. She’s trained under a reclusive monastery in Damara, and also by a Dwarven master. Her strikes are hard, fast and devastating, breaking limbs and ribs. Those that have watched her fight note that she often seems to anticipate opponents actions, often striking someone behind her or avoiding a sword strike by simply not being there. This is done before an opponent has realized he’s already committed himself. Yana is known to drink too much when off duty. Citizens in the dock district often comment that’s why she’s never been promoted. However, it’s said she’s very dangerous when drunk and not to be trifled with. There are those that say she fights even better when inebriated. Yana is the adopted daughter of Maya, Champion of Tempus who traveled these lands many years ago. Yana is often seen praying at the shrine south of Peltarch. Yana is an avid and skilled swimmer. She often pays fisherman to take her out on the icelace, where she strips down and swims for a time.